- 15 years of pet products developing and producing experience. - A4PET HAS MASTERED BOTH QUALITY AND FUNCTION. - ELEVATES your pet 6.5" HIGH above the vehicle seat for better view. - EASY TO SET UP and FOLD DOWM FLAT FOR EASY STORAGE when not in use. - TESTED MAX LOAD BEARING WEIGHT 300 lbs. - Used as a DOG BED at home. - Two faced design for warmth in winter and cool in summer, easy to convert it. - SECURITY and STURDY, provides a security leash and two seat belt loops to keep pet restrained for safety while driving. - Two faced design, two sides are made of cozy fleece and Oxford Fabric respectively, please accord to the air temperature to decide to use which side. 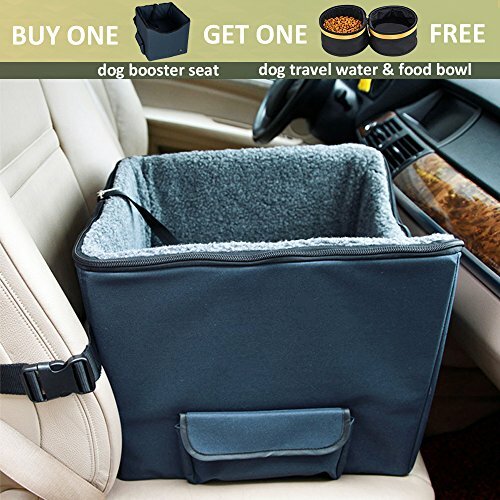 - Elevates your pet for better view inside the car, perfect for your pet to enjoy the trip. - Pet should not be left unattended on the seat in your car. - When traveling in a car, be sure to secure the seat by the belt only. If you have any questions about this product by A4Pet, contact us by completing and submitting the form below. If you are looking for a specif part number, please include it with your message.